Dirt Bikes, Drones, and Other Ways to Fly by Conrad Wesselhoeft. Review: Have you ever had to go through grief and pain? 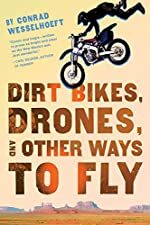 In Dirt Bikes, Drones, and Other Ways to Fly by, Conrad Wesselhoef, A teenager named Arlo has to get over grief when his mom dies. How will he get over the grief? Will he suffer or prosper? Follow Arlo and his epic stunts in Dirt Bikes, Drones, and Other Ways to Fly! Five months ago Arlo's mom had died. When she had one to the shop to get Arlo's sister Purple Gatorade, some lunatic shot her. Siouxsie (Arlo's little sister) is still grieving because she took it harder then Arlo did, Arlo loves his mom, but he has different ways to deal with the grief. He rides his dirt bike, and he plays a game called Drone Pilot. When Arlo beats the top player in it, a person from the Air Force, he gets a message from someone who works with the Air Force. Because of Arlo's amazing score in Drone Pilot, he is invited to join the Air Force in Texas. This opens Arlo up to many challenges; one of which is to beat all the other pilots in the trial. Dirt Bikes, Drones, and Other Ways to Fly is a great book. I love the tragic scenes and the action that filled the pages of this book. It shows a relationship between tragedy and action. It is nice to know how all people have different ways to deal with grief; people should know that there isn't one "right" way. I recommend this book to people 12 and up. The book isn't appropriate for younger kids because of the language. A boy might like the book more than the girl because it is mostly about motorcycles, drones and much other action filled objects. This book has many stunts in it, and some end up good while others end up bad. In essence, Dirt Bikes, Drones, and Other Ways to Fly, combines a perfect balance of action and tragedy. We would like to thank Houghton Mifflin Harcourt for providing a copy of Dirt Bikes, Drones, and Other Ways to Fly for this review. Have you read Dirt Bikes, Drones, and Other Ways to Fly? How would you rate it?